Visiting the graves of our loved and remembered family members is a ritual we enact during the year, but especially as Christmas draws near. 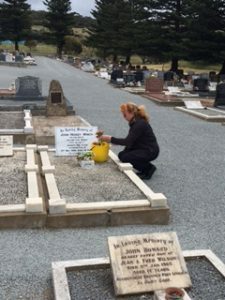 Even in the twenty-first century, there still seems to be a gender bias with grave visiting, for it’s still largely the responsibility of women – as it is in our family. In the Victorian era, adherence to the rules of mourning etiquette was a major responsibility for women – it was important to maintain social bonds between the living and the dead. It was a woman’s job to not only remember the dead at home (that’s why we have ‘birthday books’ now to keep a record of birthdays and anniversaries) but also to regularly visit cemeteries, arranging flowers at gravesites and tidying up around memorials to loved ones. When both of my parents were alive, sometimes dad would accompany mum to the cemetery when she visited graves prior to Christmas – but he would stay in the car. The grave of his son – who had died at 19 – was one of those to be visited and he couldn’t face it. But mum stoically tended the graves, with her bucket of flowers and secateurs – her son’s grave was first, then all the other family members. Afterwards, mum would say she felt very satisfied, having made her pilgrimage of remembrance so that loved ones were not forgotten at Christmas. Now my parents have themselves become residents of the communities of the dead. Consequently, there are more family graves for us to tend during the festive season, but my daughter and sister too value the social rituals which women have kept alive for generations – together we keep our loved ones close. Just as mum used to do, we set off on our pre-Christmas excursion with buckets of flowers from our gardens, with specific blooms chosen for particular link to a loved one. For instance, Uncle Tom loved bright colours, so we pick vivid red and yellow Gaillardias for him. Auntie Reta’s memory is perpetuated with feminine pink and blue statice – and we always include a sprig of rosemary for each grave. Agapanthus are flowering in December, so their blue or white flowers are often used.